Cassie has CF, and Jenn is holding a set of EBAY auctions beginning tomorrow to raise money to donate to the CF Foundation. She has a permission letter both from the Foundation and from EBAY to hold a charity auction. Won't you do your part? UPDATE: Fellow ETSIan SeeBooKnit is looking for donations for her Great Strides Walk, for CF and her daughter. Anyone interested in donating, follow this link! Add a comment with the link to YOUR walk or auction, too. A good friend of mine is going to be holding an auction on EBAY to benefit the Cystic Fibrosis Foundation. Her daughter has CF, and J has become very active in helping others with the same problem. I have donated a bracelet, and a friend has bought several earrings. When I get the pictures taken later today, look for them--the auction begins Tuesday! Meanwhile, the last few listings before I close shop temporarily on Thursday to prepare for the Down The Street Bead Show. My business partner, Art of the Firebird, and a friend, Gwacie, will be there, as well as several vendors from Southern Flames. Here's a blue floral set. An interesting reaction--I didn't know that this blue was reactive, like turquoise, and some of the beads have a red tinge--very nice! 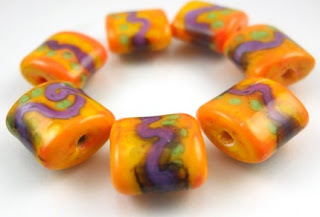 I'm heading off to the torch for more beads -- the Down The Street Bead Show is arriving fast! Plus I have a custom order .... earlier I spent some time talking with my neighbors and then swapping out the trash cans that are serving me as rain barrels. The 32 gallon is full, and the 50 gallon is filling slowly. With all the rain we have had in the last week, we are still in a serious drought with a rainfall deficit. Out door watering is banned in many places, and I have pulled out all the practices that I learned as a child in Texas to conserve water. Collecting what rain we are getting will help my garden if the drought continues--and they tend to last at least two years. Many are far longer. 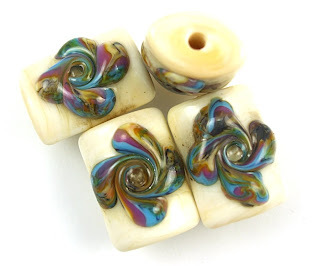 Meanwhile, I torch :) Take a twistie in bright summer colors, dot it on smooth ivory glass, and give it a bit of a spin ... and you have these colorful, sassy, raised swirled flower beads! You can, as always, find them on ETSY. 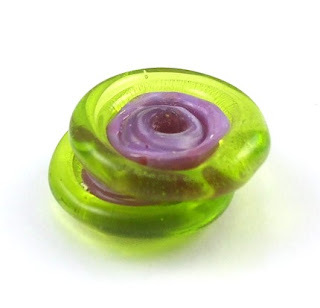 I was playing around with Da Vinci reactive glass and came up with this bead. Some folks have been very successful with the expensive silver glasses, but I haven't felt the love ... until this Kalera focal. MMMMM. Reminds me of seeing pictures of deep space or the swirls of the Milky Way. As always, you can find it on ETSY. 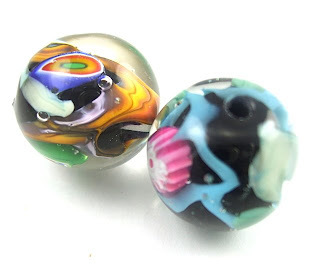 I try all kinds of lampwork techniques--guess I am fundamentally a lampwork dilettante rather than a craft master of a single approach. Today I am back to my main love, though--organics. I started withe a purple base and layered twisties in various reactive colors over it. The result was an earring set that reminds me of the Southwestern landscape. Oh, you want to see it? Here you go! Purple stayed on my mind when I was at the torch. Here's a fan pull that can also work as a finial -- very clever design for which I can take no credit at all. This violet swirl laced with veins of silvered ivory stringer would look lovely in any room--a piece of functional, practical, unique art. How do fan pulls work? You begin with a base wound around a threaded socket: .Then you add a brass fan pull adapter: That means the fan pull can act as a lamp finial, too. A fan pull! This one is on ETSY, too. And as always, thanks for looking! 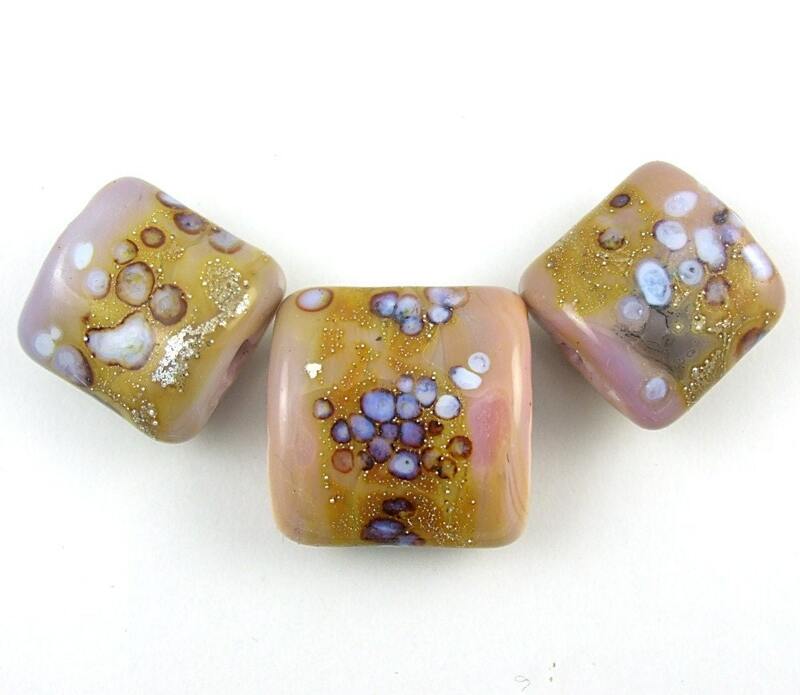 I don't generally do scuptural beads, but sometimes they're just a fun break. I like seashells and leaves ... and bones. 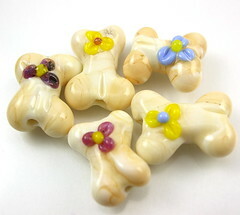 In honor of my Corgi's return to health, here are some dog bone beads, just up on ETSY! There's also this set that has the colors of a medieval tapeastry.. 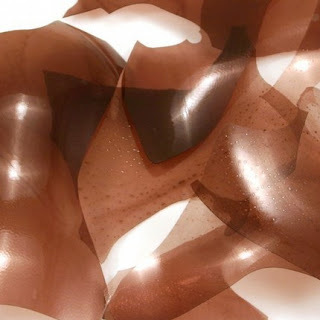 I was playing around with different twistie recipes that people had shared, and came up with this. . A twistie is a gather of two or more colors of glass that you have stretched out to a thin rod, twisting as you pull, so that the original colors are twisted together. 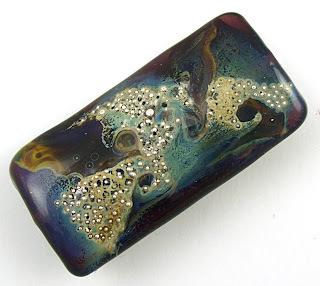 When applied to a base bead, particularly one that has had sterling silver foil melted in, the reactions can be stupendous! On the personal front, my Corgi has recovered (I thought I was going to lose him). While I worked in the back yard yesterday after work, weeding the small starter raspberry patch and beginning to clear out debris (the previous owners didn't clear out any fallen limbs, just stacked the brush in corners of the yard), I brought Piglet out to sit in the weeds-that-pretend-to-be-grass. Able to walk around or not, that is definitely a happy Corgi. Meanwhile, I have been experimenting with quark beads. Mine are not well-defined, but I want to keep playing with them. Part of the problem with mine is color balance and the type of stringers I used. 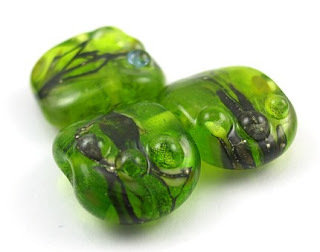 If I make some brighter twisties and a couple of rose petal stringers, I think the beads will be more interesting. I was also beginning with too large an initial barrel. And look at that sharp pointy end! Feh. The nice dimpled end you can't see because this was a fast snap and I didn't focus it right. 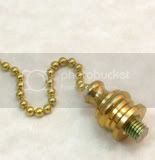 You can see a video on making quark beads on You Tube. As usual, the middle of the week is fairly hectic. Those are three long days, between office hours, teaching (four and a half hour classes!) commuting, and ensemble rehearsal. 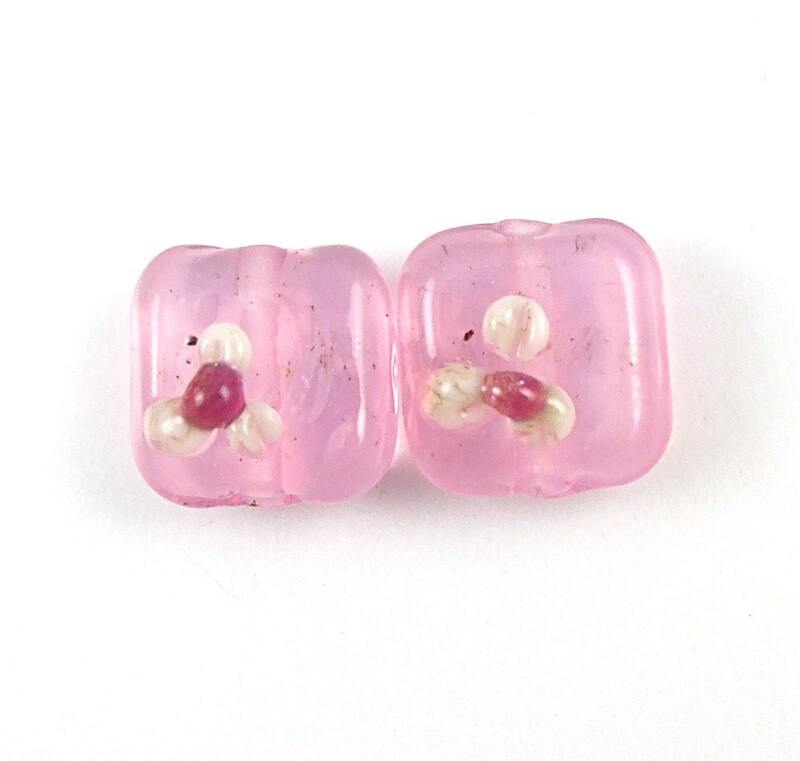 However, I did post a couple of new listings in the last two or three days. The most recent is Fiesta II. This color combination and design got a lot of attention the first time out, and several people have asked that I repeat it. While every set is unique, there are some that are more easily added to. I don't want to say "duplicated." I varied the stripe pattern for these. You can see more pictures over on Etsy! A month or so ago I took a class on making glass shells at Flame Tree Glass in Roswell. I learned far more than just shells, though! Blowing bubbles had been something that I had tried, but had put aside. I didn't want to blow out the glass and make dangerous-to-breathe glass "confetti", or otherwise damage my studio or me. 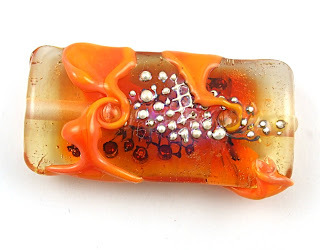 For those who don't work with hot glass, a shard is a thin piece of broken glass that can be used as a decorative element in a lampwork bead. 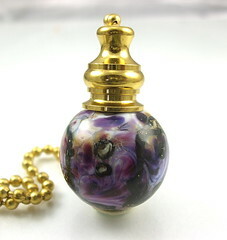 Bubbles are the basis for glass ornaments, glass sculptures such as shells, and other such things. Several Etsians sell shards, such as AvenueBeads. The top photo is one of Avenue's shard pictures. The first thing that I learned was that the way you wind glass on your blowpipe--which can be an inexpensive piece of stainless steel tubing or a highly engineered Italian blowpipe--influences the size of your bubble. Apparently glass has grain, like fabric or paper, and winding your glass so that the grain parallels the pipe will result in a larger, more even bubble. Coiling your glass on the end of the pipe actually means you will get a smaller bubble, because it sets the grain in the wrong direction. 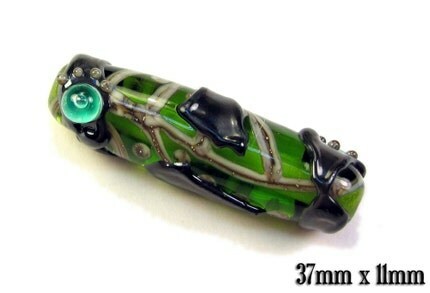 So just work that glass onto the end of the pipe as you would create a large blob of glass for a focal bead! The second thing I learned was not to get glass up the blowpipe. It gets hot in your hand, and all the glass is wasted. (This is an especially good point if you are using your instructor's expensive Italian blowpipe.) An ancillary point here is, when you plunge your blowpipe into a vat of water to break off the impacted glass and begin again, put your thumb over the (cool) tip of the pipe to keep steam and boiling water from spewing through the pipe and onto your arm. Closing the cool end pressurizes the pipe and keeps the steam from rising through it. The third thing I learned was to roll my glass moil (the blob of glass on the end of the pipe) on a marver (a flat surface). This smooths out the surface of the moil, but it also evens the glass and helps you avoid hot spots and thin spots later. The fourth thing I learned was to work far out in a soft, bushy flame. There is too much turbulence close to the torch face to make a good bubble. A bushy flame also means that it is a reducing flame -- i.e. more propane than oxygen. That will inevitably affect your colours, and you will have to experiment. Fifthly, I learned that it takes short puffs, without a lot of pressure, about the same as when one is playing recorder. If you don't play recorder (why not???) then short puffs are what's needed. I have to return the moil to the flame several times -- the first few puffs give me the temper of that particular glass; the second puffs even out the moil, and the third heating and set of puffs actually begins to make the glass move. Along those lines, the sixth thing I learned was to wait a heartbeat before puffing; that allows the moil time to equalize heat. When the glass begins to move, blow smoothly and steadily until the bubble is the size you want. At that point you can blow out a side to start shaping a seashell,or you can lay the bubble aside until it breaks from thermal shock or you whap it gently with your marver to produce shards. The final things that I learned are: Every glass is different. Begin with a sloppy, loose white, and then move to a nice stiff black. After that, try every color to see how it behaves. I also learned that glassblowing students have come up with every tired joke about "sucking" and "blowing" that there is, with a few to spare. Mostly, however, I learned that I had been afraid for no reason--blowing glass is fun! 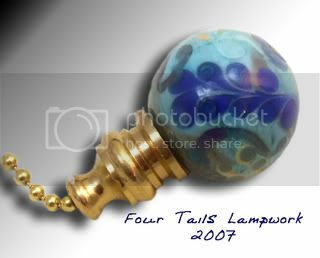 The second picture is of a bead made with shards by my friend Flamekeeper. Both of these are on ETSY. 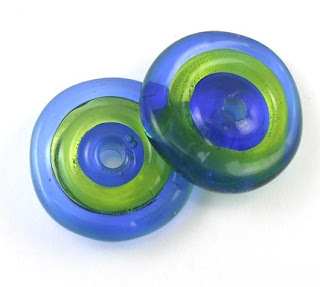 The Blue-Green disks reminded me of a cool summer's day, while the purple green disks put me more in mind of spring flowers! Another Etsian, Littleput Books, has a lovely idea. Sometimes, when the stress of life gets to be too much--the demands of the Real Job, family concerns, running business full time or in your spare moments ... take a few minutes and think of five things that were good about the day. Or even the last hour! 1) The sun is shining! 2) The tornado did not come near me or my neighbors. 3) The coffee smells very good. 4) I love the way my Corgi snores. 5) When I see my back yard I see all the things I still have to do -- but I also see all the successful things I have done. What's been good about your day so far? Just listed on ETSY! This rectangular focal will stand out in any application! I layered sterling silver mesh onto a pale persimmon transparent base, and then wrapped cantaloupe -coloured shards around the bead. Then I swirled the ends of the shards to complete the elegant texture. 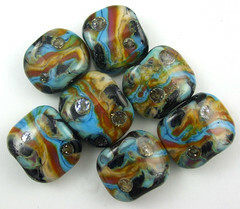 Also listed, a set of six water-coloured nuggets. I love color, but my favorite is the clear sea colours of a Mediterranean coast. 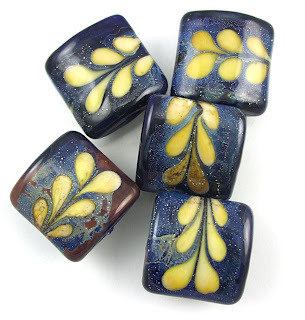 This bead set captures those perfectly! 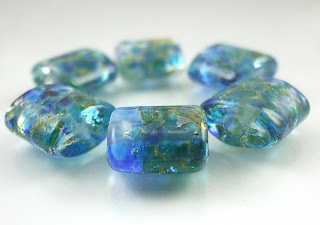 Transparent blues sparkle over sterling silver and a clear base, reminding me of a summer pool. Between working hard to help the international students in our program register for the next eight week academic term, and fixing a plumbing leak, I haven't been at the torch for a few days. However, I've got some time tonight, and I am looking forward to it! 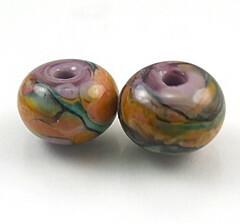 Meanwhile, here's a new ETSY listing, a tube focal bead with a raku twistie. 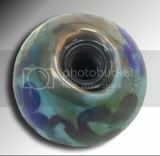 I like working with raku glass twisted with intense black. The raku turns all sorts of beautiful colours in the torch's heat, depending on how you work it (and, some say, whether the Raku Gods are with you), but the black stays crisp and dark. 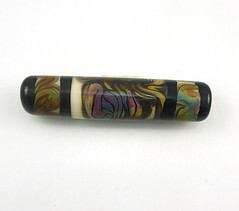 On an ivory background, you also get reactions like the ones you see in this bead. 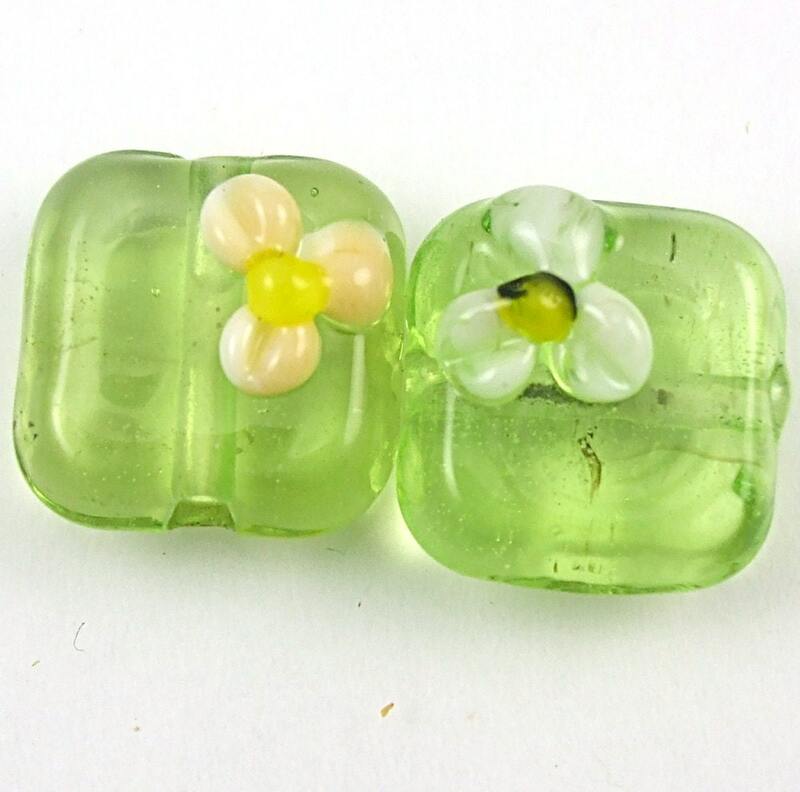 A floral earring pair in green. Get Glassy Goodness on your RSS Feed Reader!